Michelle and Lina at our campsite. Ian enjoying the Friday sunshine. 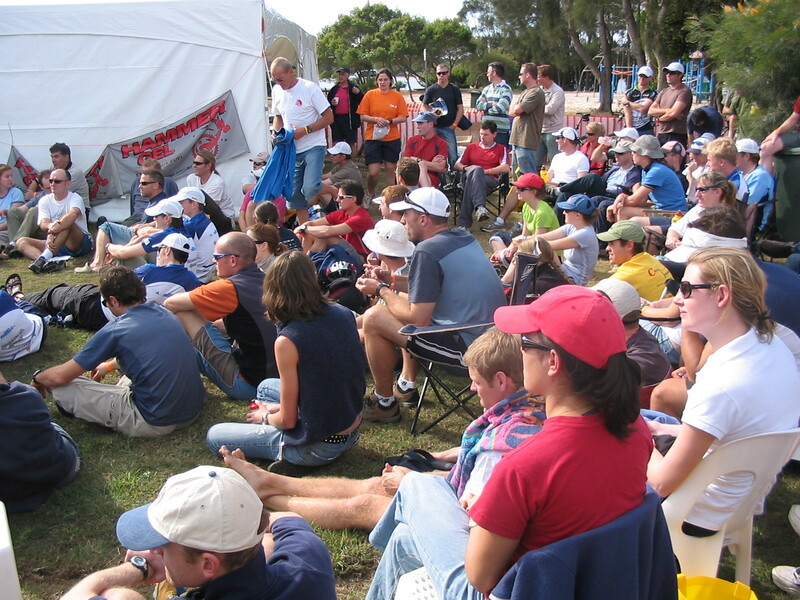 Lots of people at the Midday race briefing. Yet more people during the briefing. 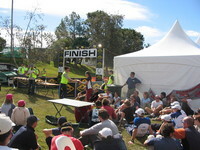 Julie picking up the Tangerine team bibs at the briefing. 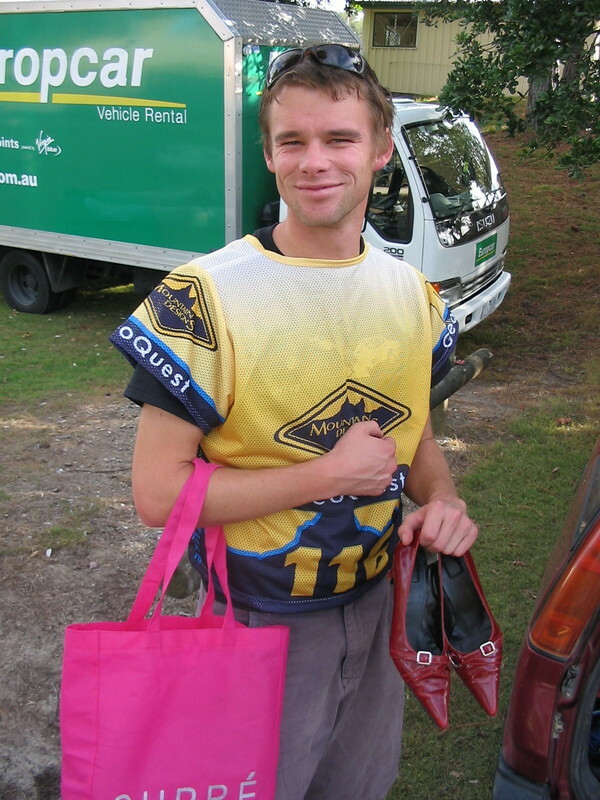 Ian accessorising for adventure racing. Michelle riding her very nice very light new mountain bike for the very first time. Michelle, Ian, Lina and I marking up the maps on the floor of the laundry at our camp. 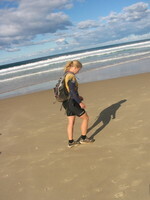 Our solo support crew, my sister Jane at the beach before the race start. Ian waiting for the race to start. 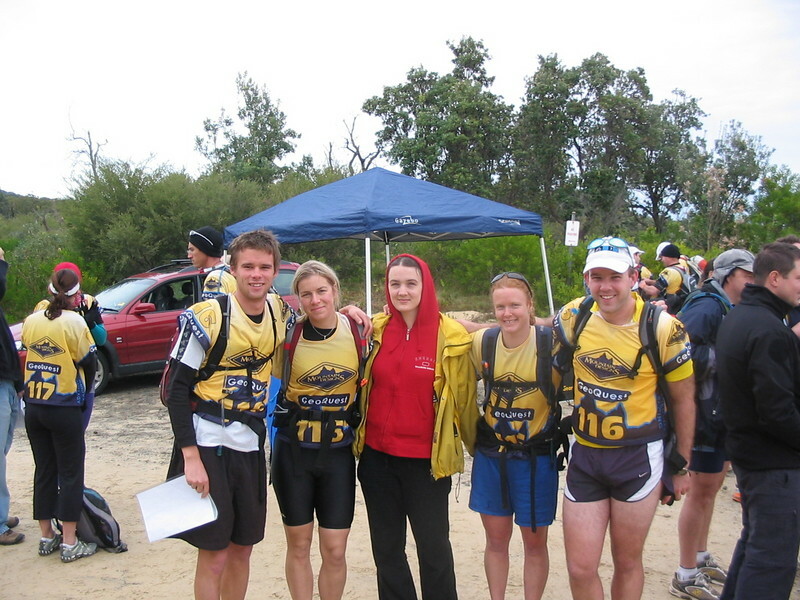 The team and support crew before the start. 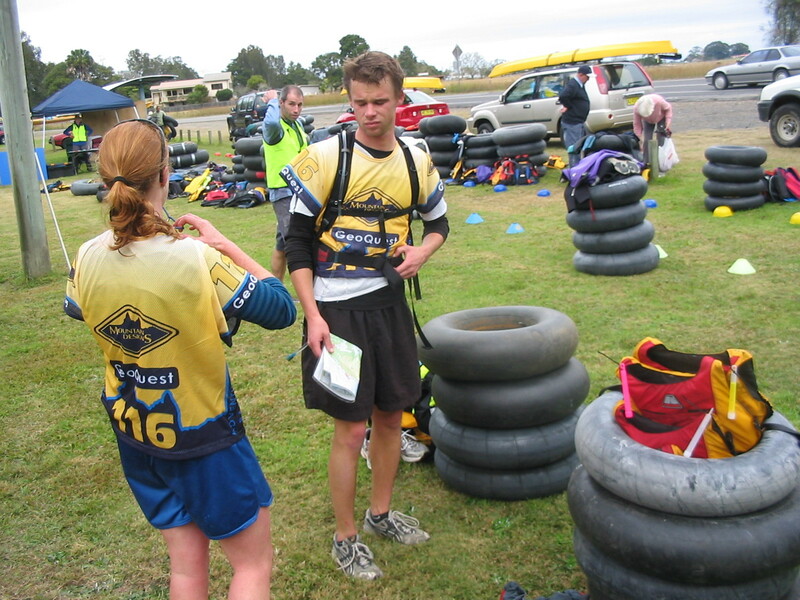 Ian and Lina on the start line. Michelle and Lina running up the first hill. 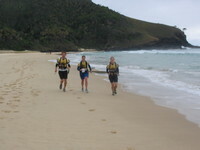 Ian, Michelle and Lina on the first beach after grabbing CP 2. 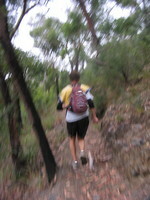 Ian running on the gorgeous walking track to Smoky Cape lighthouse. Lina and Michelle on the walking track. 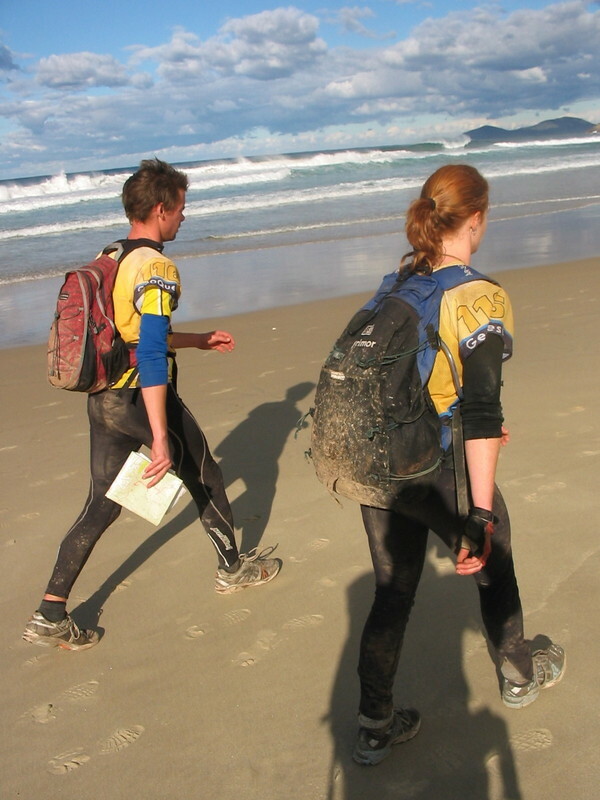 The GeoQuest adventure race, run by Craig and Louise of Geocentric Adventure Racing, now in its fifth year the race has always looked like fun, in some perverse sleep deprivation and pain are fun, sort of way. I thought it would be good to try the Geo Half out for my first attempt, the shorter and easier course should help considering I do not train for any sport and the only sport I am good at of those we compete at is the cycling. Also I had to convince 3 other people to join me in a team for the event. 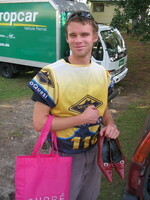 Initially I talked Lina into joining the team and soon after than Sarah Lunney signed on, then we were for a time looking for a third woman to join the team (hoping to reverse the standard mixed team structure in these races of three guys and one woman), however Ian mentioned he was really keen to do the race, he is fun to ride with and a strong competitor so we could hardly say no. 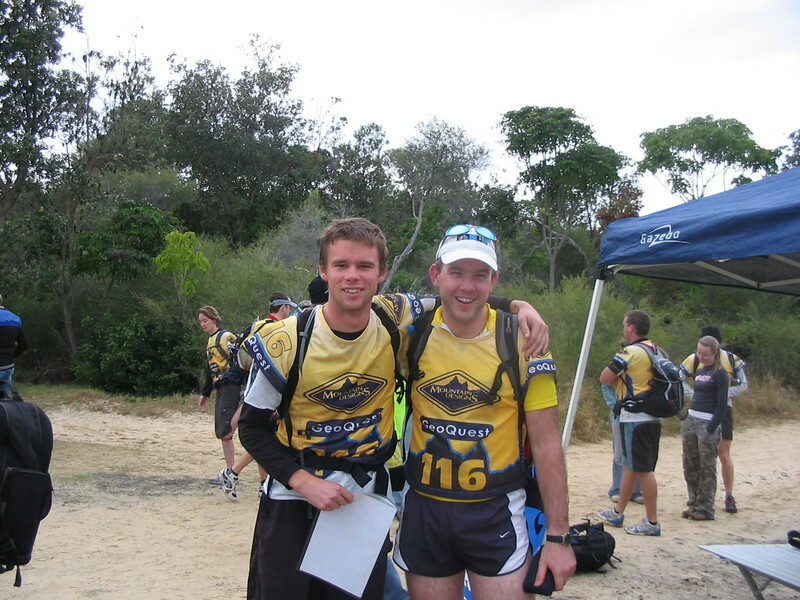 Thus around a month and a half before the race we had a team finalised. Or so we thought, we were not doing any training together as a team, and had not even all been on a ride together at one time but who cared, we were not planning to go hard, simply to have fun and complete the event. So we now had a team, with a meeting of all the team members over chips and drinks at Debacle courtesy of a gift voucher I still had left over from my previous 24 hour adventure race, the AROC 24 Hour in March. 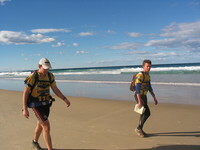 We sussed out required equipment details and other equipment we needed, discussed the fun and pain we expected to go through at the race and got ready for heading north the following week. Ian was giving Michelle a lift up on Thursday after work, stopping overnight in Newcastle to pick up Michelle's new bike and rest up. I had been hoping to get up to Grassy Head by around 5 or 6 pm, leaving Canberra around 9 or 10 am if I could. However when I went to put my roof racks on the car they broke and I had to buy some parts in Braddon and mess around with a drill and a few others things to mount them and secure them. In the end I picked up Lina and we started the drive north a little after midday. Jane was teaching at Macquarie Uni until 10pm so would be hopping on the train to Macksville on Friday morning to join us around the second briefing at 4pm on Friday. By the time we got to Hexham I realised we would not make it into Taree before 6pm and rang my Aunt there to arrange for her to buy a CDMA prepaid starter kit for use with the CDMA phone I had been given. 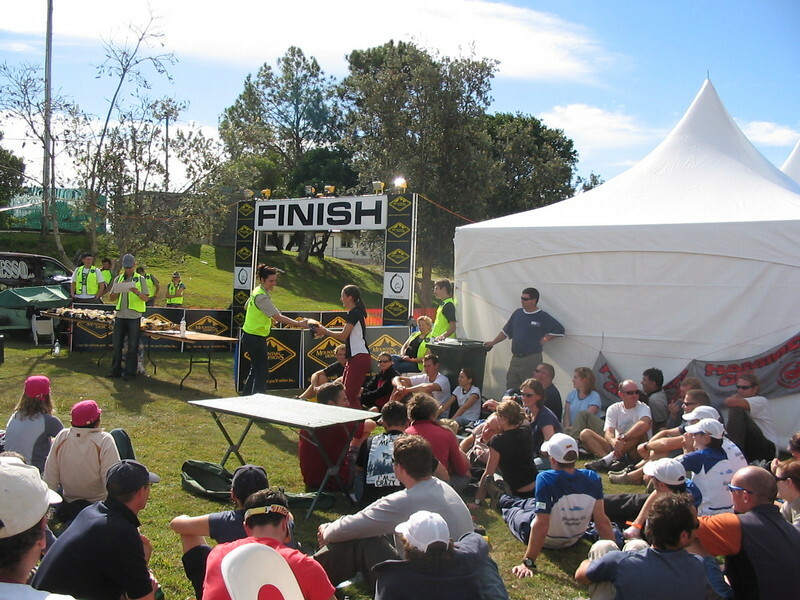 CDMA is only popular in regional centres, I had ordered a single CDMA prepaid starter kit about 2 weeks before the race in Canberra and none of the Telstra dealers were able to get it in in time for various somewhat suspect reasons. Eventually someone at a Telstra shop in Sydney suggested I try regional centres, this worked and I found the Taree Telstra shop had them in stock. 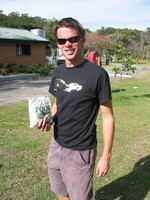 Anyway my Aunt Jude in Taree bought the kit and we would swing by her house on the way north to pick it up. I feel like such a yuppie now I have two mobile phones. 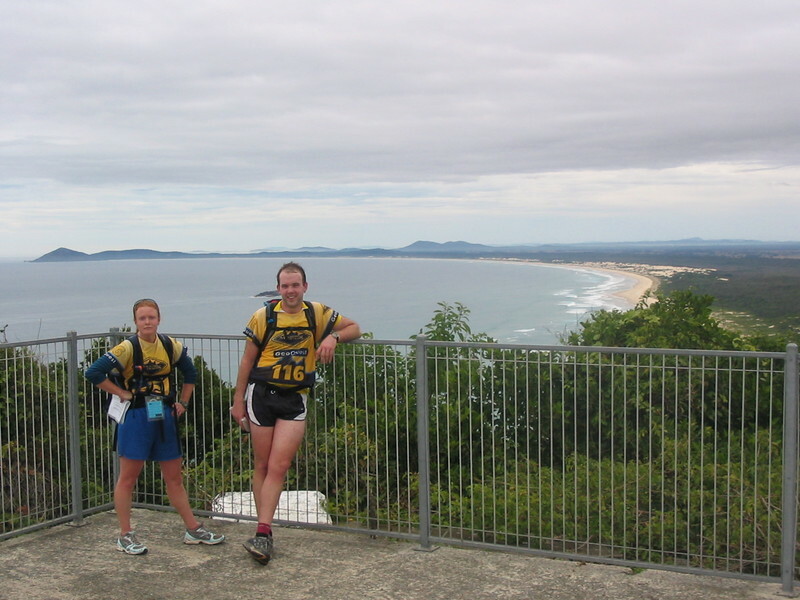 As we continued, further thoughts suggested to Lina and I that arriving at Grassy Head around 9pm to erect the campsite, cook dinner and head for sleep would possibly not be fun, we decided to ask Jude if we could stay the night at Taree and continue in the morning. Jude was happy to have us and we were able to cook up our dinner and enjoy comfortable real beds there before leaving at 6:30am in the morning in order to arrive at the campsite and later the race site before 9am. Lina and I arrived at our camp site and were set up by around 9:30am, we then sat and waited for Ian and Michelle to arrive from Newcastle. 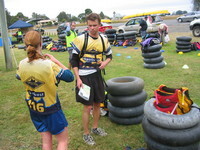 Almost as soon as they did around 10:45am we headed over to the race venue at Stuarts Point in order to register, pick up our kayaks, get our maps and prepare for the race some more before the briefing. After the midday briefing we realised we would have to duck back to our camp to get some of our kit that would be required in the gear checks, Ian stayed to mind the kayaks and start on some of the checks while the rest of us ducked back. 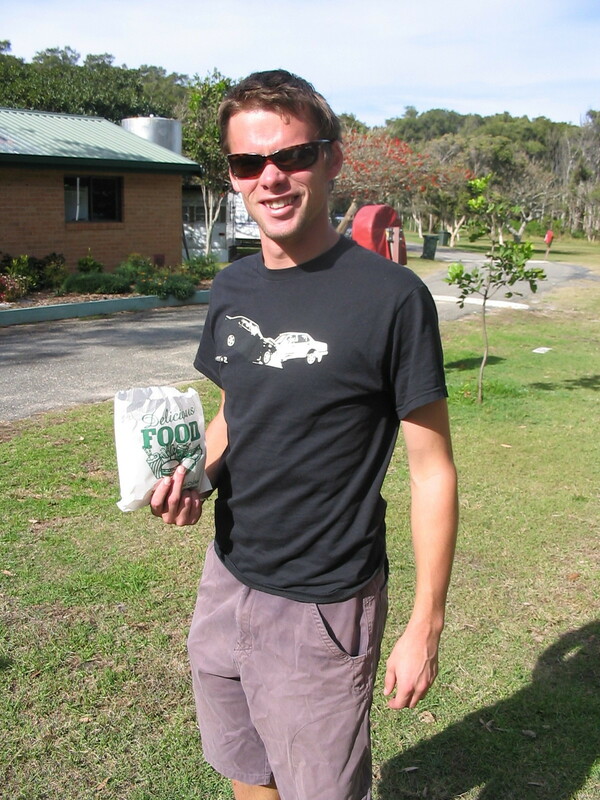 After we completed the necessary checks we headed back to our camp, it was now comfortably after 2pm and I had to head in to pick up Jane from my grandmother's place in Macksville. Ian came with me to do some shopping and we got in there by 3pm to learn Jane's train was running almost an hour late. Grandma had cooked up a huge amount of really tasty food for our team to eat over the weekend, from herbed baked potatoes, and rissoles to pasta and some sausages. Along with a heap of fruit and a lot of fresh bananas she gave us (the Bananas were straight off the tree almost courtesy of another aunt in the area who owns a banana plantation) for race food. We packed this an a few others things we were borrowing into the car, headed to the shops and gave Michelle and Lina a call suggesting they ride in to the 4pm presentation as we would be about 20 minutes late. When we got back to presentation we sat down and then Jane appeared a few minutes later being dropped off at Stuarts Point by Grandma. Craig announced the Geotwist would happen at 8pm and we needed one chocolate bar and one life jacket, after the briefing we ducked back to the campsite for some dinner and continued prep for the race. The Geotwist turned out to be a swim out to the middle of the river at Stuarts Point in the cold dark 8pm water. I did this for the team as the prize for those who did it was a get out of control point free card (what was continually referred to by us and probably other teams as the race progressed our "get out of jail free card"). 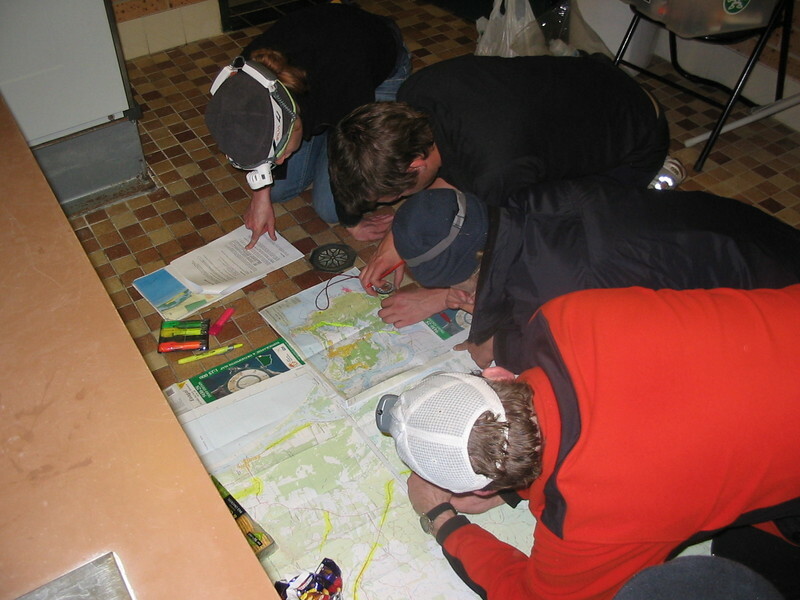 We returned to our campsite and worked on our course planning and marking up the maps until they were ready eventually getting to sleep a bit after 11pm, not the best race preparation, however we were there for fun not sheep stations and were simply looking forward to the start. Awake at 5:30am on Saturday morning in the hopes of having our race food ready, breakfast eaten, instructions for Jane and anything else ready by 6:30pm in order to get to Arakoon at a reasonable time. We eventually left camp at 6:55 and arrived at the carpark beneath Trial Bay Gaol just before the required 7:45am briefing time, fortunately it did not start until 7:55am, then pretty much on time we were away with the 8am start. Everyone was running into this first leg. We drifted to the back of the field quickly, content not to put much effort in on the run, after all our stated goal was to complete the race uninjured as a complete team. We had discussed using our "Get out of jail free" (almost appropriate considering how close we were to Trial Bay Gaol) card on checkpoint 2 as it required a fair bit of height loss and gain, however decided early in the race we would be fresh enough and content enough to get it and instead it would be better to save it for the night foot rogaine in Tamban forest somewhere. 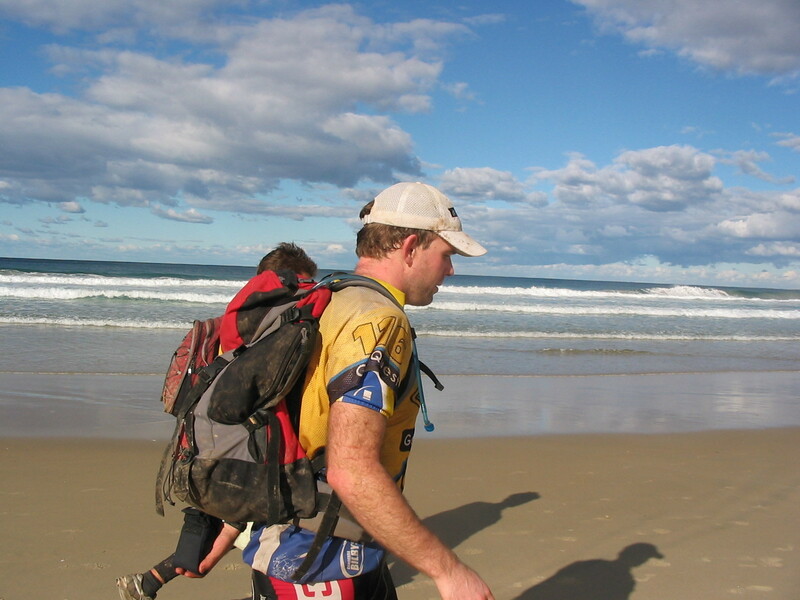 We came out on the beach and had a slight nav issue for a while thinking the control was in a different location, eventually realising it was in the almost vertical creek ascending up a steep gully we checked it and headed off along the beach toward the lighthouse. The walking trail to the lighthouse was gorgeous and fortunately mostly flat so we were running along it all the way and got to the light house fairly quickly. From there down the road and along the rather sandy trails to the next control we slowed a bit as running in deep sand is not trivial, though we passed a team or two who were walking. 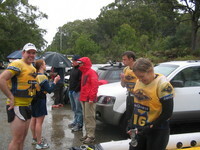 As we came in to the transition from run to tube leg 1 the leading full course team caught us up. We liked the idea of seeing a fast/experienced team for a while as we had hoped to see how they did the tubing in case there were any tips we could pick up. Realistically I think the only real tip is be a lot fitter, train for it with a fair amount of swimming and possibly try out different tubes and tube configurations prior to the race. They were a lot faster than us and soon disappeared up the river. 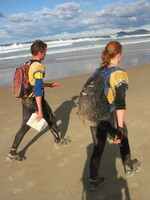 We were however pleasantly surprised to hear later we had the fastest tube leg 1 split in the Geo Half, I guess our habit of pushing a lot with our legs whenever we could touch sand in the middle of the river helped speed wise. 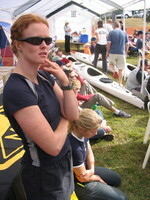 On the kayaks we soon realised Lina and I were a fair bit faster than Ian and Michelle, we attempted to get them to draft us for a while, however Ian said as we only had one rather short kayak in the race it may not be worth the effort of drafting. (the blow up kayaks we all had are difficult to steer and really do not move fast) Eventually so as to avoid going faster than the other two, and to give us something to concentrate on in the rain while kayaking, Lina and I drafted Michelle and Ian for a large amount of the kayak leg, that definitely made paddling easy. 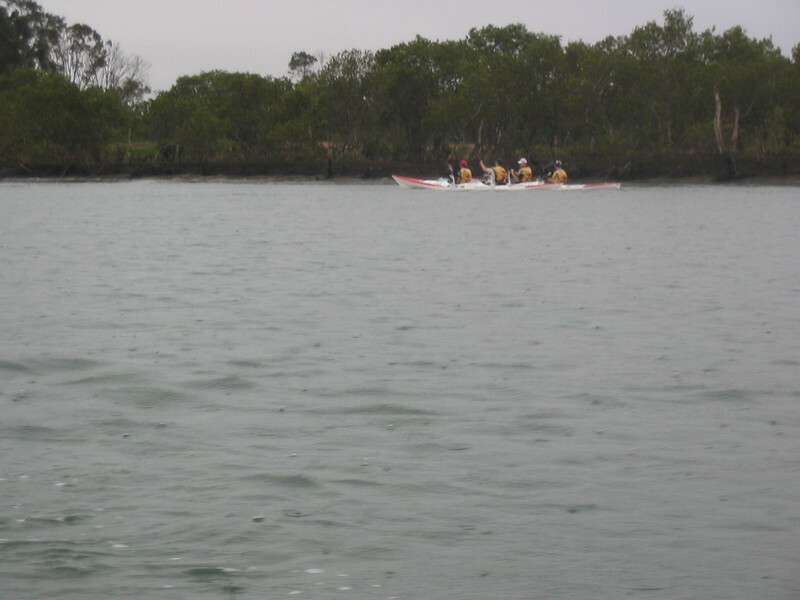 We followed a few teams over the portage and wall into the Macleay arm rather than paddling around. We were soon caught up by Alex and Selina's full Geo team Atlas who paddled around, and then later just as we finished the kayak leg Dave, Julie, Randall and Gary of Tangerine caught us up, all of whom paddled around. I know they were in faster boats, however due to the horrid deep mud and the effort involved in lifting the Sevylors we may have been better off paddling around also, ahh well no harm done and hindsight is often different (the Coulda, Woulda, Shoulda principle definitely applies here). The rain had been coming down fairly heavily now for a while (since the start of the first tubing leg) however we were warm enough due to wearing life jackets, so we transitioned to the final tubing leg and headed off walking down the oyster/sand flats toward the checkpoints on the channel markers. This leg took a while and was fairly tough, however the only way through was to slog on and get it over wish so we did, running in to camp not too long past our original projected time for finishing the wet legs in order to transition via a car shuttle up to the second half of the race. At this time with the enforced 20 minute wait at the campsite followed by the minimum 50 minutes until the start of the next leg (much of which would be driving) we were hit by the fact we could not leave for our own campsite to get our bikes or prepare for the next leg until the 20 minutes were up. 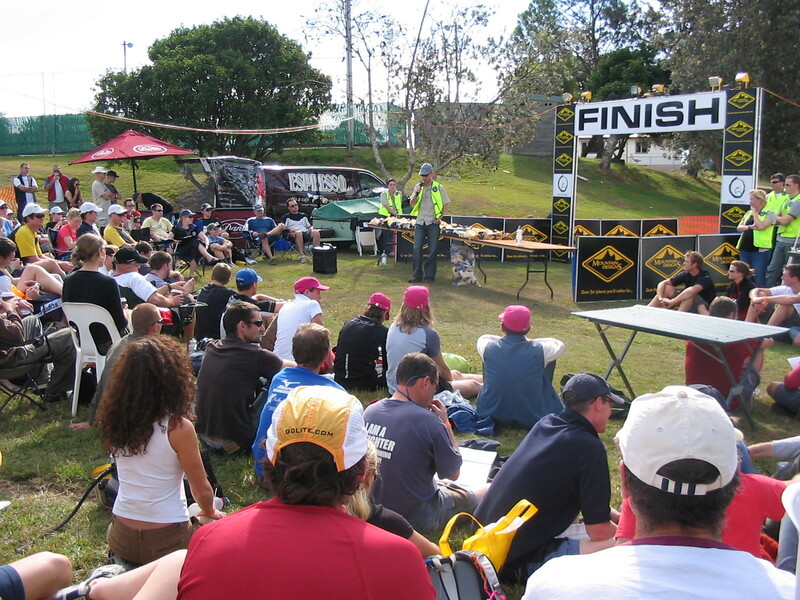 Most teams were camped at Stuarts point, however there were no campsites left when I rang up around 2 weeks before the race to get a spot. Fortunately for us Jane, Jude and Grandma had rocked up to a shelter at Stuarts point and heated up some food and gotten hot drinks ready for us so we could spend the 20 minutes eating and relaxing a bit before rushing off to our camp. 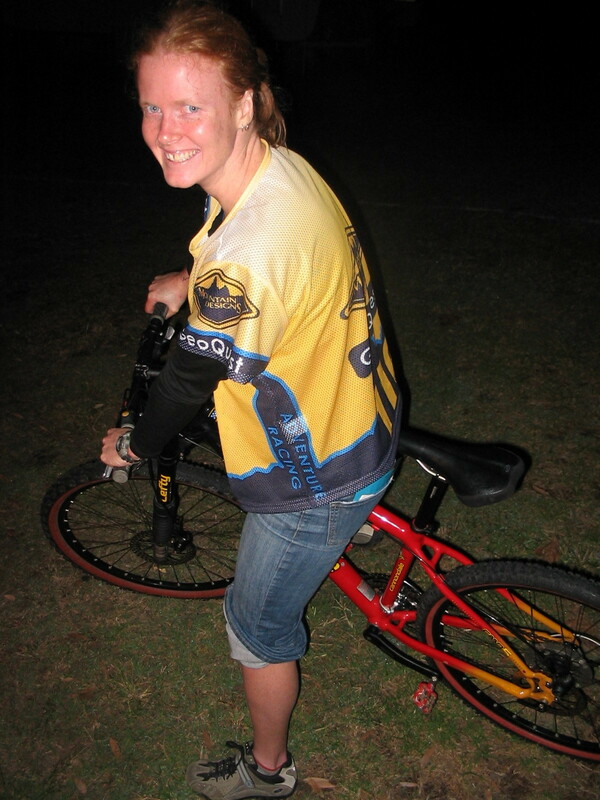 We got to camp and ran around getting our bikes ready and on to the car, a this point we realised Lina's bike had a flat tyre, so we had to pull it off (Tubeless) and put a tube in, this delayed us a bit, as did getting some more food in to us. 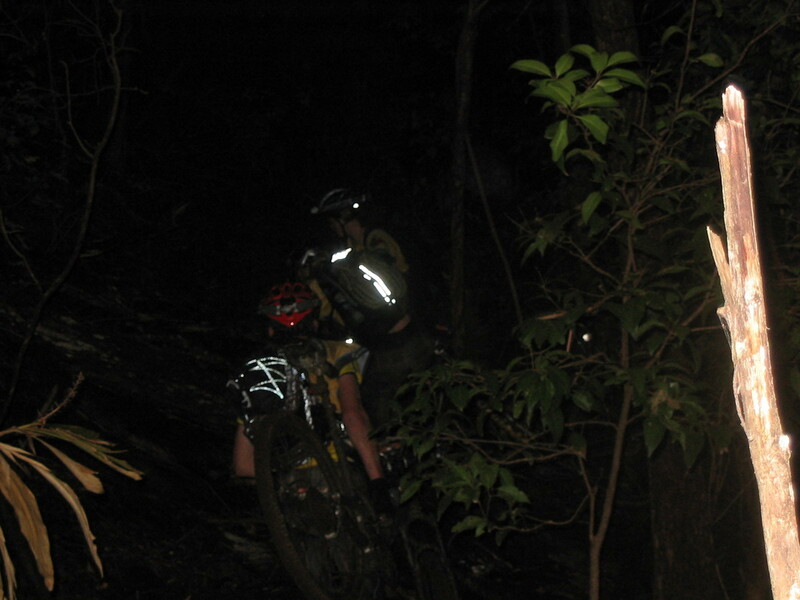 We eventually drove on up to Tamban Forest and arrived a bit later than we had planned, unpacked and ready to go we set out in the dark for the cyclegaine. In theory we were stronger at cycling than all the other legs, however as with all the other teams, our times were beginning to blow out a little, I notice all the teams I have spoken to since said their predicted times blew out a lot over night, largely I suspect due to the wet conditions most of Saturday. On this bike leg we were moving fairly slowly and mad a nav error once or twice, though happily found all the controls we wanted (9 controls all up to minimise our time in the foot rogaine to follow) in a reasonable time. The instructions suggesting controls as being 5 or 10 metres from the track were often way off with the need to double most of those suggested distances and hunt around a bit in the scrub. My helmet light stopped working early on, fortunately Michelle had a spare 5w light on the bars which I swapped to my bike and had the correct batteries to power for the rest of the night. Equipment wise all out bikes performed pretty much flawlessly, apart from brake pads wearing out to nothing on Ian and Michelle's back brakes. Ian and Michelle had 3w Luxeon based head mounted lights they used for the entire night both on foot and on the bikes, these worked a treat and I am convinced I need to get myself something similar now rather than vistas on the bike and a weak (in comparison) 1w luxeon on the run legs. 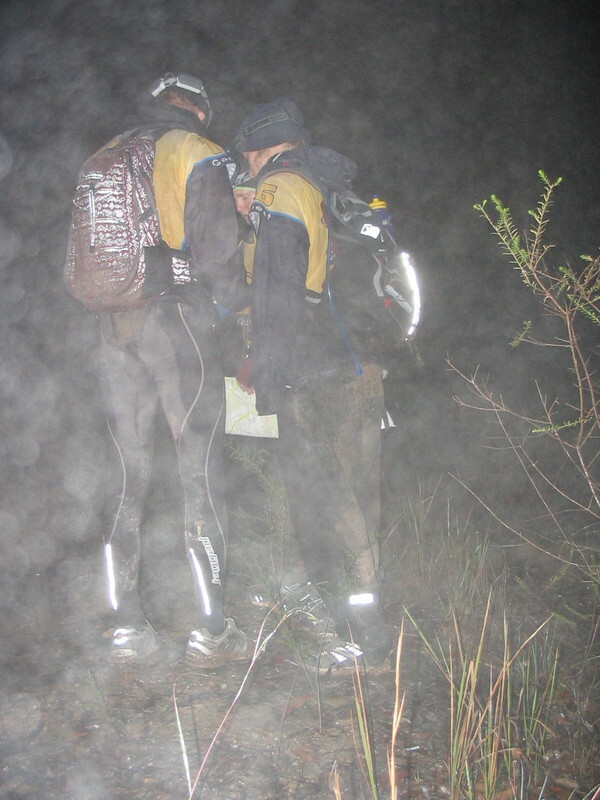 We were finally on to the foot rogaine a little before 10:30pm, spirits on the team were high and it was expected this would be our toughest leg, the time of night and the discipline were likely to be difficult (well definitely for me). We had a strike of luck in that the rain stopped around 11pm and from then on we were walking in a gorgeous full moon lit night with wet trees sparkling in the moonlight above us toward a lightly clouded sky. 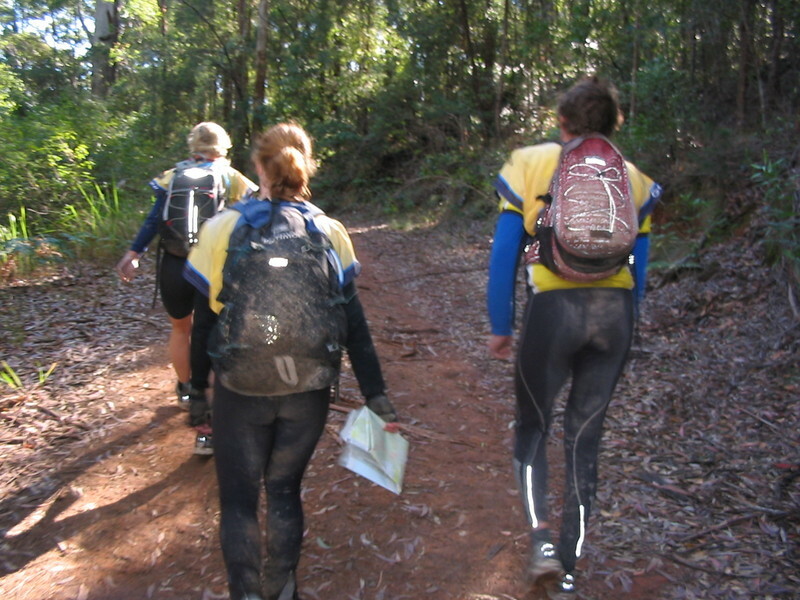 We changed our choice of controls for this leg as I was definitely travelling slowly when ever we went off the trails into the scrub for a control. 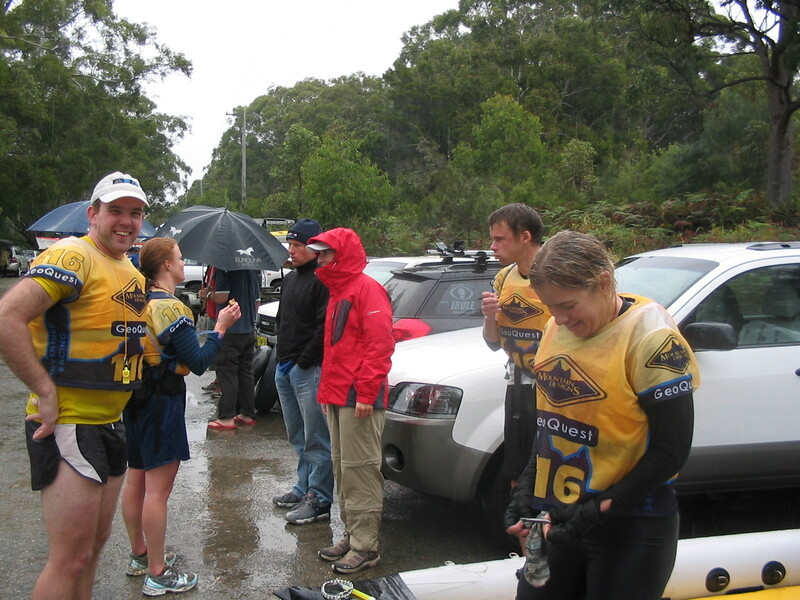 I was travelling slowly to a large extet because the ankle I injured before the Jindabyne Multisport was becoming more and more painful, Michelle got a bandage out and did a fantastic job of bandaging my ankle to support it better, it gave me less trouble for the rest of the race. 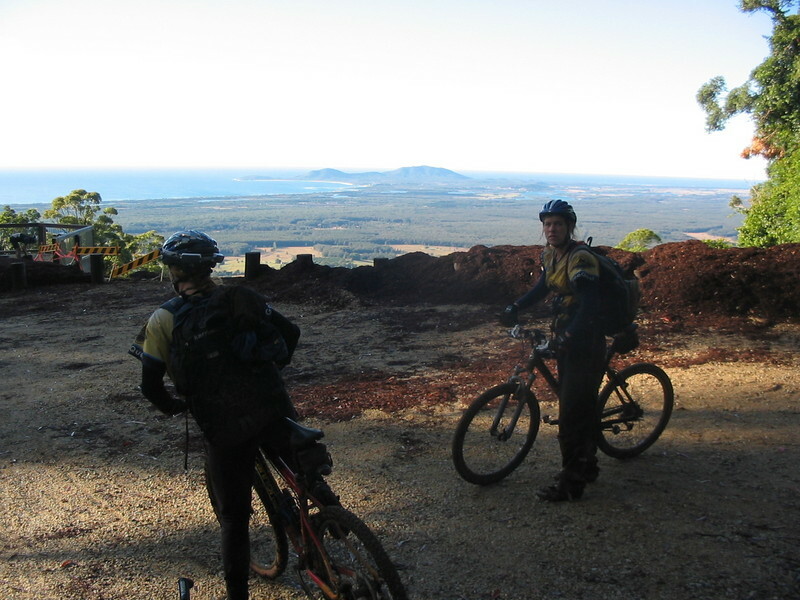 After the first two scrub controls we modified our plan and headed for a slightly longer but mostly firetrail based loop through to collect 6 controls, decided we would definitely be using our get out of control free card for one of these. Even with the one less control here we took around 5 hours to complete this leg and were not back and on the bikes until a little after 3:30am. We made another mistake or two on the nav in this foot rogaine, however we were all tired and pushing through or energy reserves so it is not a surprise and hopefully similar to the things happening to other teams. We were lucky when we went to get control N, we stumbled upon it finding it on he wrong way of the railway line as we were headed toward where we expected to find it. A little later a team coming in the other direction said they had spent ages looking for Q before giving up and heading elsewhere, we almost changed our route plan, however decided to look for ourselves, this is fortunate as we found it directly with no nav problems in the first place we looked. 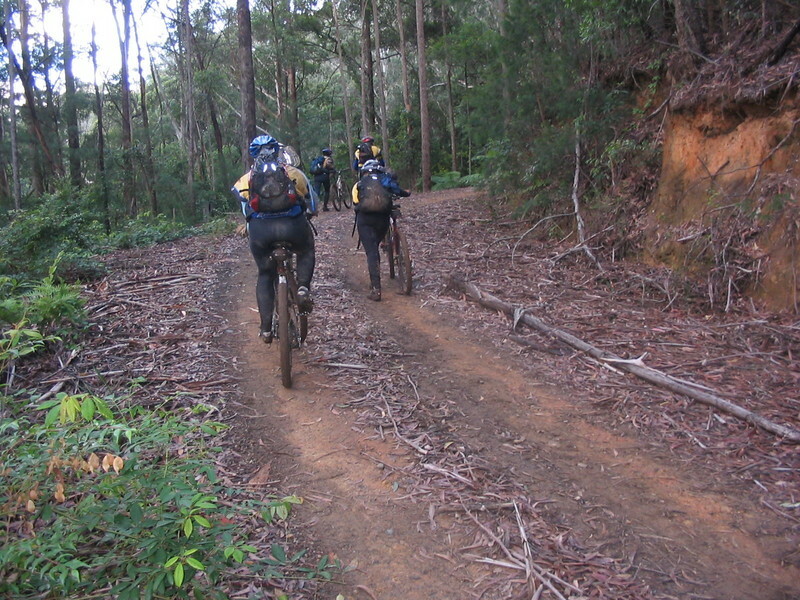 This next leg consisted of a gentle ride down to the Pacific Highway followed by some undulations heading up to the base of Mt Yarahapinni, at this point, we had searched on the map a lot on Friday evening to see if there was any other possible way to avoid the next bit, however Craig had ensured the only ways up were lugging a bike through jungle under the power lines up a section of the map that was a nice pink colour due to how close the contours were, or finding an old track that may or may not be there still going up the gradient of contours. The course instructions strongly suggested the power lines, and as a lot of teams had been through by the time we arrived there were foot prints and skid marks (probably skids of teams sliding half way back down the mountain) on the way up to sort of follow in an upward direction. This was of course the hike a bike from hell, no one sensible would ever do this, no one would ever do this outside a race situation, it would have been tough getting up there on foot. 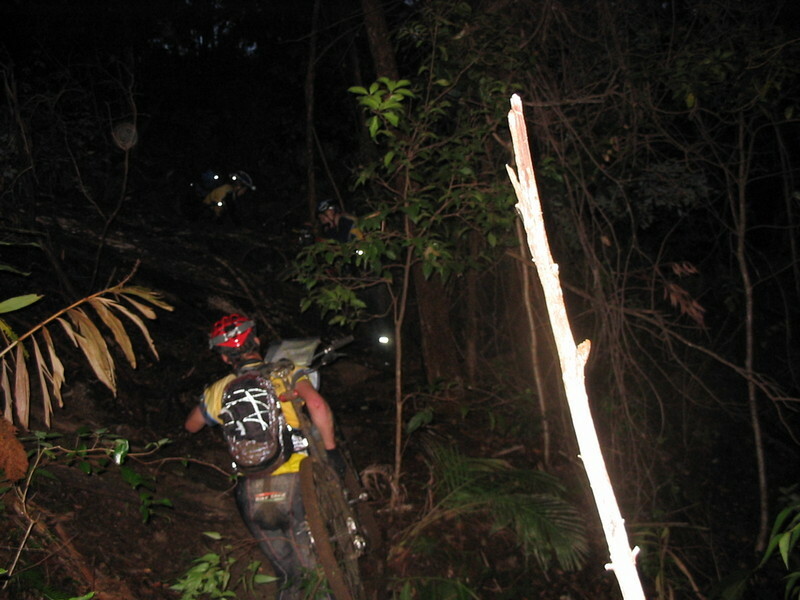 On foot lugging our mountain bikes it became shall we say, somewhat insane. I can perfectly understand why Craig had no intention of showing his face near the top of this hill at any point during the race as no one would have been held accountable for their actions. Fortunately I suppose, like I imagine child birth (some women do have more than one child) may be, the pain and horror of the moment was blocked out not long after the hike a bike and our sleep deprived brains started to somehow make it all rosier. However unless you wish to expand your vocabulary of the more colourful phrases available to us I advise against questioning any team who did this leg too closely about their experience of this leg. 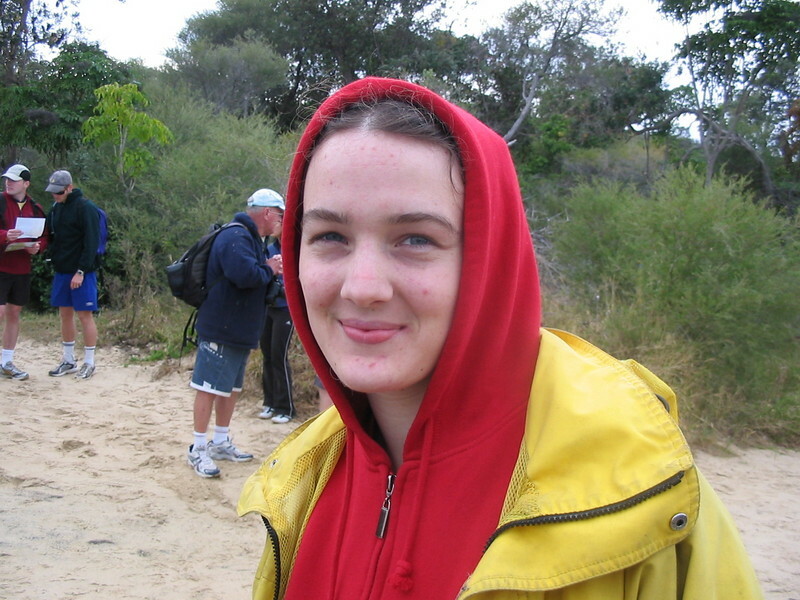 We were even lucky enough to expand out Swedish vocabulary in this direction as Lina reverted to Swedish fairly often during the ascent of Mt Yarahapinni. 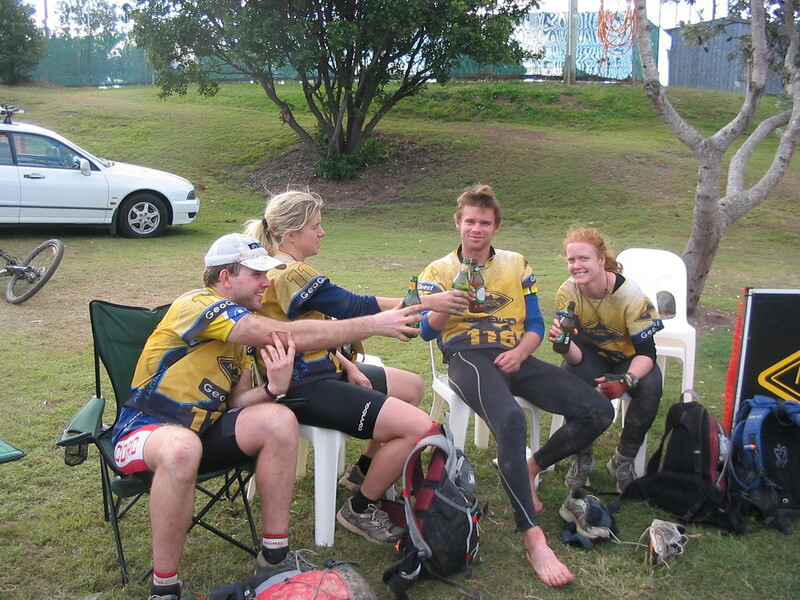 After this we had a lot of downhill and a few steep climbs through to CP 14 and the transition to the team split, for this we were planning to send Ian and Michelle out to collect two controls on foot and Lina and I would head out for 3 of them on bikes. In hindsight it would have been better if Ian and Michelle grabbed all three of controls X, Y and Z on foot leaving Lina and I to head out to get V and W at the most distant points by bike. However we split it such that the bikes would also pick up X, this was not too arduous, it simply meant we took longer. We finished the bike points in three hours to find Michelle and Ian had an hour to wait for us at CP 14. As we started the split leg we were surprised to hear we were the 6th team in the half to come into CP 14, much further up in the rankings than we had expected. Thus we avoided wasting time as much as possible in the CP and before and after the split got moving as fast as possible to do the final trek to the finish. Now we just had a few undulating hills, a descent to the beach, a bit of coasteering and a beach or two to trek along in order to make it to the finish. I suggested we could walk most of the way and I could be encouraged to run if it looked like any team had a chance of catching us. This plan of mine to avoid any more running worked up until we came down off Grassy Head and saw another Geo Half team about to ascend onto the head. 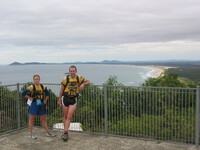 Thus once we hit the beach we ran the first half of the 3 KM up to the pathway in to Stuarts Point. 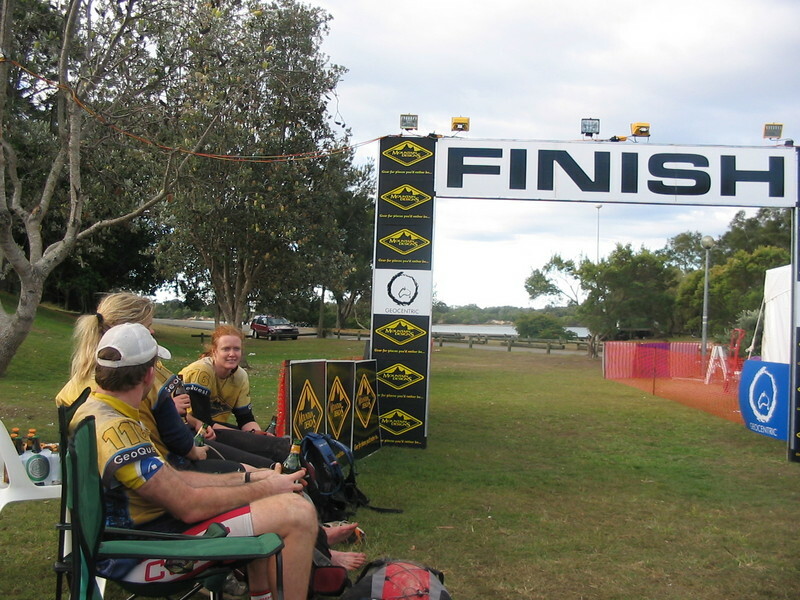 At this point we looked back, realised no one could catch us and walked the rest of the way to the campsite, of course we did the contrived run from the end of the bridge 100 metres to the finish line, but hey isn't that part of the event? Looking good for the crowds! Well that was fun, 31.5 hours out there, lots of gorgeous bushland, some hard bits my memory is already blocking out I assume, some bad weather and some good. I wonder what other people do on their weekends? On the whole my team absolutely rocked, I could not ask for a more fun, steady and solid bunch of people to do this race with. 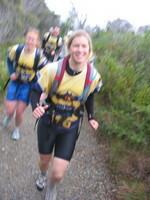 At no time during the race did anyone complain, we joked around, we kept going, we had fun and had a rocking good time. Way to go Ian, Michelle and Lina. In order to complete the full course next year I think a fair amount of training will be in order (oh no the T word, I have never trained for anything in my life <g>). 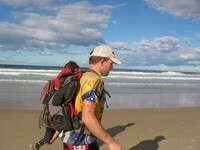 A lot of kayaking (and the need to procure some Mirages or similar boats for the race itself), more running (probably on the order of maintaining 2 10 KM runs and 1 20 KM run a week for at least three months leading up to the event) preferably with a pack with at least a 3 litre bladder of water on my back. Some fast treks, maybe an over nighter or two at speed (though with camping and stopping and rest and such). 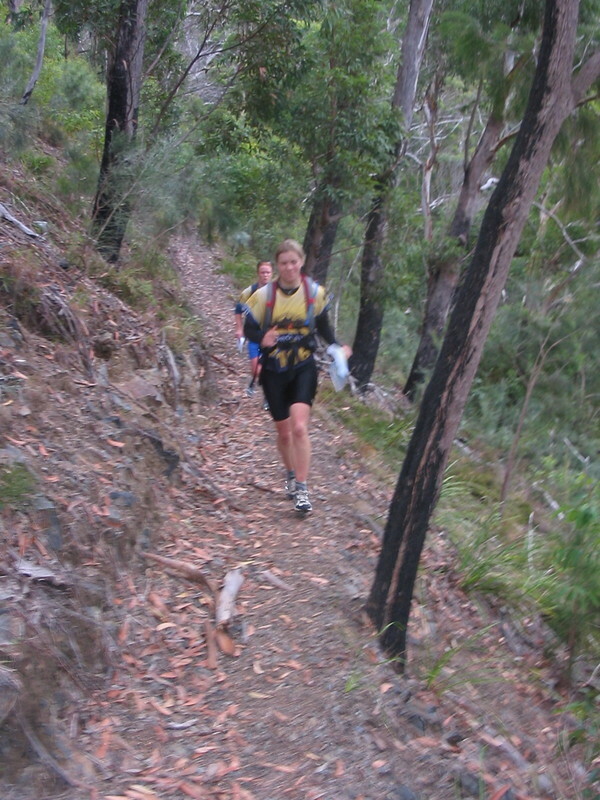 Tom Landon-Smith (AROC) suggests loaded fast treks on difficult terrain around town, such as rocky ugly tracks up and down Black Mountain, Mt Ainslie, Mt Taylor etc with 15 or 20 KG in a pack on your back. 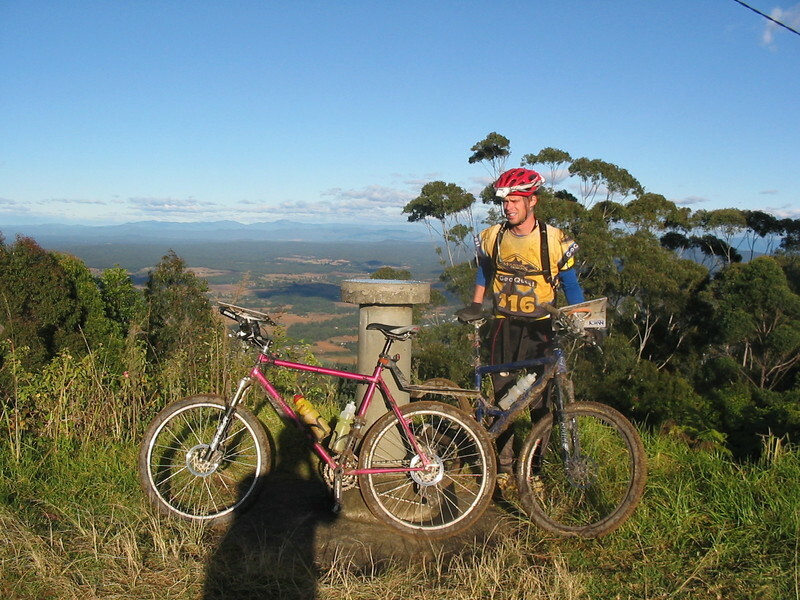 I also need to improve my foot navigation as that is my poorest skill in this sort of racing I think, that means participating in a few rogaine's over the next year to make me practice the foot nav rather than only mtb nav that I get more practice in. 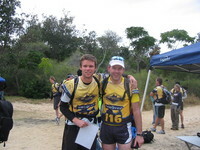 We finished our first attempt at the geo half which was our main aim, we are fairly happy about that as of the 16 teams who started the half only 6 managed to finish. 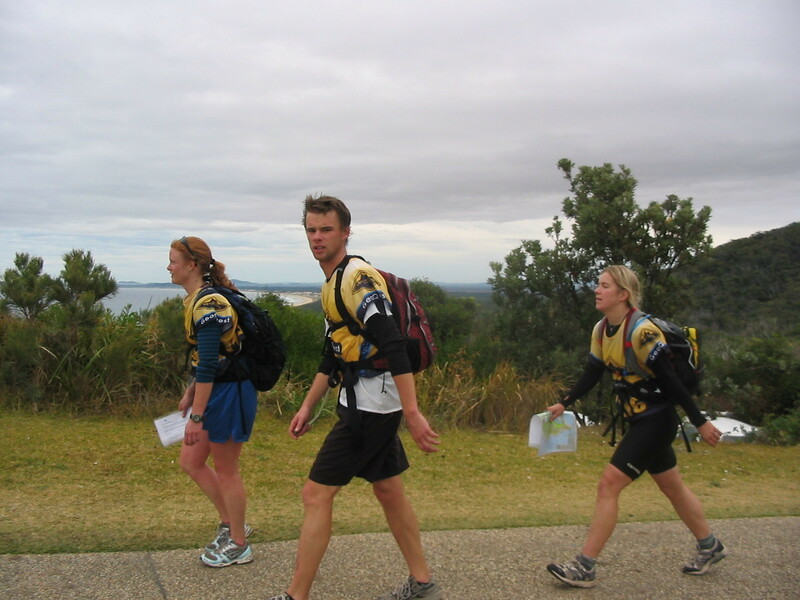 That is a high attrition rate, though not as bad as the full which had only 13 of the 43 teams starting Geoquest that managed to finish the race. Lina is keen to do the full Geoquest next year, I also am keen Ian and Michelle may have other commitments, however if they can manage we may want to bring back the same team. 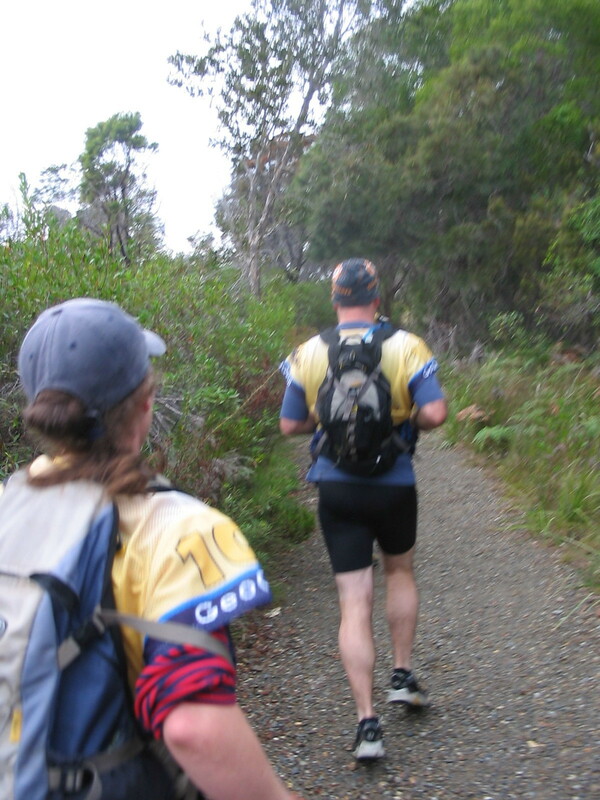 Otherwise this first hit out in Geo has given us all a bit of experience to go on in preparation for more adventure racing whoever we team up with. 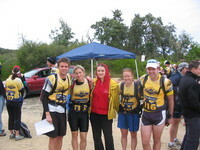 Thanks to Craig and Louise for putting on another kick arse race. Thanks to all the other teams out there for being a bunch of friendly faces out in the bush an I hope to see lots of people back there next year. Walking up to the lighthouse. The view from the lighthouse with Michelle and I.
Michelle and Ian transitioning to the first tubing section. 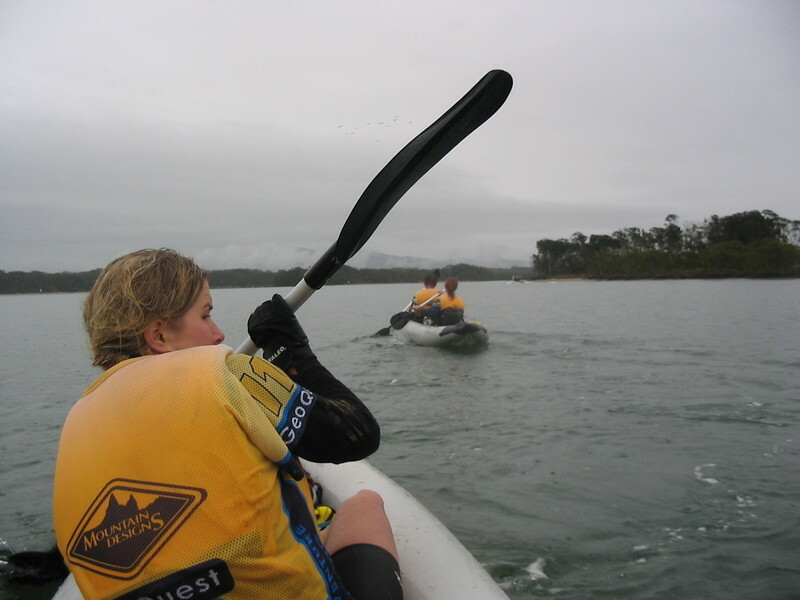 Out on the kayak leg, Lina in front of me with Michelle and Ian in the other boat. Some other team, full course competitors, ripping past us with paddling ability and faster boats. A somewhat damp transition to the second tubing leg from the kayaks. 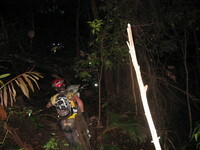 Out on the foot rogaine up in the Tamban forest around midnight having a map discussion. 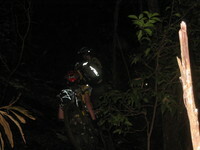 Finally on fire roads climbing up toward the top. Of course we went to the top wondering if the control was up there or at some lower point, this is the view from the top. And this is the view from the lookout where the control actually was. 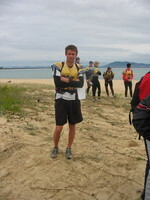 After finishing the split section we were finally on our way to CP 15 and almost finished the race. Lina on the beach trek toward the finish. Ian and Michelle on the beach. Myself and Ian from the front almost finished.